Can a 94 year-young retired animator practice dynamic balance exercises for elderly such as agility ladder exercises for seniors, stepping response, and other agility drills? Are there safe seniors balance exercises that older adults can do to reduce their risk of a fall? In this blog I cover a number of these dynamic standing balance exercises for elderly. In the video above, this 94 year old demonstrates a command of a number of dynamic balance exercises for elderly and shows how her balance has progressed over the years. For the past few years, I have been fortunate to work with Ms. McLaren (she prefers to be called “Babs”). The drills required some modification. But she can do them. And Babs has realized significant benefits from practicing the dynamic balance activities for elderly people – most notably her improved balance has made her more steady and confident. It has also given her personal satisfaction in her progress. Ladder drills are popular with professional soccer and football athletes for increasing agility, speed and quickness. 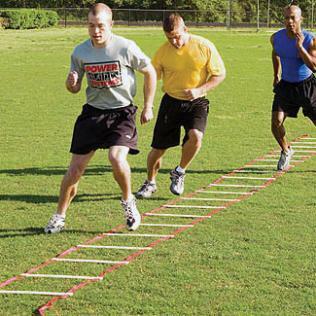 The players run down a flat ladder (usually made with rope or tape), and step in and out of the ladder as quickly as they can. Agility ladder exercises for seniors are a modified version of the athletic drills. They can be categorized as advanced balance exercises for seniors. These same drills — generally referred to as agility ladder exercises for seniors — can be applied to anyone at any age, including seniors, who wants to improve their dynamic balance. As we get older, our neuromuscular system (our nerves and muscles) becomes less responsive. Quick changes in direction become more difficult. The ability to catch oneself when falling diminishes over time. As a result, I encourage all of my clients, regardless of age, to incorporate balance training into their exercise program. I also encourage them to incorporate strength training as it helps them catch their fall, crawl if they end up on the floor, and have the strength to stand up after a fall. It has probably been a number of years since you have done any balance training. I suspect that if I was to perform an assessment on you, that you might be surprised (and disappointed) by your results from the balance test. Unless we deliberately practice our dynamic balance exercises for elderly, such as agility ladder exercises for seniors, we will lose our ability to maintain our balance. One of the physical therapy balance exercises for elderly used by Physical Therapists when an elderly patients start to lose his or her balance is something known as a stepping response (it is more of a test than an actual exercise). A stepping response is a balance response that occurs when someone steps quickly to adjust from a loss of balance. Seems simple enough, but if your foot does not step out fast enough either forward, sideways or backward another body part (such as your hand, arm, hip or head) will come in contact with the ground. This can lead to a bruise, strain, a sprain or, worse, a fracture. One way to improve your stepping response is to practice dynamic standing balance exercises for elderly (described below). Movement patterns: As most of us age we have a distinct patterns of movements that we do each day. Challenging that pattern prepares your body for the unexpected. Muscular recruitment: When we incorporate agility/balance training we challenge muscles in the front and back of the legs to work together. Torso muscles also work to assist in the balance. Dynamic balance during activities and exercise: The ability to maintain balance through movement, is directly impacted and improves. Speed and reaction time: The ability of the body or part of the body to move quickly. Combining strength training with neuromuscular training is a winning combination. Strength training improves a muscles ability to react against gravity. Side-to-side stability is very important in the prevention of hip fractures. Lateral, forward and backward stepping drills can improve side-to-side stability. Many times a fall can be prevented if the person places their foot behind herself. This will allow her to regain stability. Backwards stepping drills help develop this skill. Dynamic balance exercises for elderly can also have an added benefit of learning a new movement pattern. Many of my clients over the age of 60 require several repeats of a pattern. We start slowly at first and I have them follow along after me. We then gradually increase the pace and complexity of the drill. Ms. McLaren, because of her advanced age, would generally forget the drill from session to session. While her mind forgot the exercise, her body did not. Each time the drill was introduced, it required less time for her to learn. For example, when presented with an open or closed ladder, Ms. McLaren can recall the basic drills. 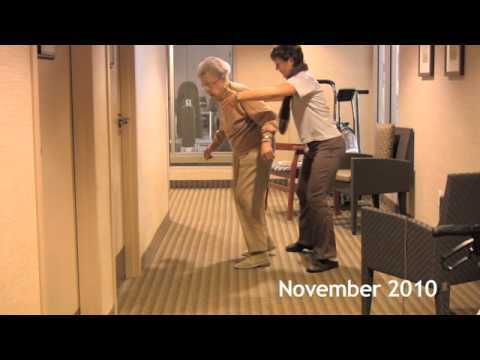 The video has the many of the variations of the dynamic standing balance exercises for elderly. The type and variety of seniors balance exercises and agility drills you do is only limited by your imagination. Starting at the side, facing the length of the grid, move: Step forward into with L/R Sideways step L / R ; backward step L/R; Sideways step L / R ; forward into with L/R etc. Lead first with the right foot then repeat leading with the left foot. When beginning agility ladder exercises for seniors, start with 2 to 4 drills and once you master these, then introduce new drills. I loved seeing the progress in this elderly woman. I am concerned that she is always looking down at her feet/floor. I would like to see a visual and/or auditory component added. Combined with the strengthening that is occurring with repetition, walking in the figure 8 pattern while looking at a focal point on the wall would help with flexibility in the neck, trunk and legs as well as improve balance. Hi Brenda, Thank you for taking the time to comment and share an idea that has worked with your clients. I do encourage her to keep her gaze up during the agility tasks but have not tried using a visual cue. I will incorporate your suggestion (of adding a visual component and figure eight pattern walking) into future drills. I encourage others who may have used the Infinity Walk or other approaches to share their experience/knowledge. Be well. interested in success stories esp from post menapausal women [ I’m 66] taking post breast cancer hormone treatment/arimedex. Hello Susan, I was just chatting with Richard, my life and business partner, about posting success stories in the New Year. Maybe you would like to be one of our success stories. Let me know if your interested. I wish you well in your treatments. I’ve subscribed to your program, as over the past year I’ve lost some femoral neck density. still osteopenic tho. my spine was better on the dexascan, but my onc doc pooh poohed it as just arthritic change.., which evidently looks like more bone! i have realized from research and dawn finally breaking! that my use of my beloved trek poles that have kept me moving [ osteoarthritic knees] probably kept my femoral neck from keeping bone! so i use them now for a 3 point balance when walking, as needed, and mostly do not lean on them. as well, i have for years loved that i ‘crawled’ rapidly up stairs, and used bannisters often to go faster up and down. i am now going more slowly, and not leaning on bannisters or stairs [ my infamous crawl!]. weirdly, i would ‘crawl’ up the stairs to jump while i brushed my teeth! i didn’t do my crawl in public, but i felt very agile being able to adapt and move quickly. i hope to be a success story! For those of you less familiar with the anatomical movements that Valentine is describing – it is translated as lying on your back in bed or on the sofa to put your shoes on. Starting with both knees bent, cross one ankle over the opposite knee to reach your foot. This is practical when wearing indoor shoes or slippers but not practical for outdoor shoes. Thanks for sharing this tip with the readers. 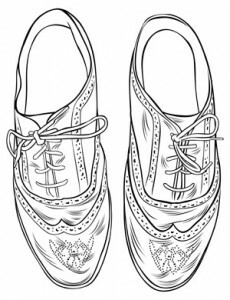 As Valentine can relate, this way of putting on your shoes can be a”God send if you have back pain. Susan, You bring up very good points. You could also consider stomping up the stairs and wearing a weighted vest while you use your beloved treking poles. You are on your way to being a success story – keep well. I did get a weighted vest recently. i wore it too long the first time.., and up and down stairs; it took a lot out of me! I was surprised, and gave it a break this past week, and i’m about to restart w/ it.., w/ 5 pounds of the 10 added removed! Thanks for the very informative site. The articles and videos are very helpful to me. I am Physical Therapy Assistant here in Canada. I am currently upgrading my skills to become a registered Physiotherapist. I am doing my homework right now, it is a research outline. I writing about the walking program that we do at work. Your website is very useful and helpful to me. I can’t wait to share this knowledge to my co-workers. Hi Orma – Glad you are enjoying the site and find it useful for your work as a PTA.